In the late 1970s, Disney joined the movie space race with “The Black Hole,” which despite its flaws is pretty good. Back when I was in grade school, I remember getting the Weekly Reader kid’s magazine. I can’t say that I remember much about it, except that sometimes they also came with a catalog for books. And at those times, one thing they offered was a comic book version of the movie The Black Hole. One of my fellow students got the comic first, and showed it to some of us, and for a boy who had seen the first Star Wars when it was the only Star Wars, the comic was incredibly engaging. I eventually got my own copy of the comic, and wish I knew what happened to it more then a few years ago. But while over the years I had seen bits and pieces of the 1979 Disney movie adaptation, I don’t think I’d ever seen the entire thing in one sitting until recently. The small crew of the exploratory space ship Palomino encounters a large black hole. They discover a nearby ship that they identify as the Cygnus, an earlier exploratory vessel that had been missing for 20 years. Aboard the Cygnus, the Palomino crew find a ship filled with robots inhabited by only one man, a genius doctor. But things go bad when they discover the robots aren’t really robots, and the doctor plans what seems to be a suicide mission into the black hole itself. If your idea of a live-action speculative Disney film from years ago might be The Absent-Minded Professor or Freaky Friday, this movie might be a pleasant surprise. Though it has its share of cutesy elements, the movie overall keeps a fairly serious tone, and even gets dark in a few places. One man gets a set of rotating blades jabbed into his chest, though his death is kept bloodless. The story offers treachery and cowardice, robots that are actually similar to lobotomized people, and a mad man and his pet homicidal robot. It’s a little amusing to see the actor Maximilian Schell addressing a robot with the name Maximilian. I don’t know if that was intentional for whatever reason, or just a curious coincidence. But the robot Maximilian is the show-stealer of the movie, a multi-armed red giant with a single red eye. He screams “Evil!” for the moment he comes floating on-screen. On the good guy’s side are the two small floating bots, Vincent and Bob. Vincent is the smart-aleck of the movie, and Bob the old beat up guy, something like ‘Mater from Disney/Pixar’s Cars movies. To be honest, the robots are pretty much the most interesting characters in the movie. The human acting isn’t bad, certainly not B-movie over-acting bad, but is nothing special. Thought the movie received Oscar nominations for its visual effects, watching it now just shows how dated those effects look after all this time. That’s not meant to be a slam on the FX people; their work was very good for that time. In the comic, the story ended on a coherent, somewhat positive note. I guess I hadn’t seen the movie’s ending before now. Perhaps this is for the best, because honestly, the last five or so minutes of the movie were simply bizarre and incoherent. I really can’t think of any physical object that is more overwhelming to my mind then the black hole. My limited knowledge of what such a thing is makes it mysterious, threatening, the ultimate rabbit hole down which there is no coming back. Some of the characters in the movie compare it to Hell. But at times the movie’s madman views it as a way to God and to eternal life. This is why he wants to journey into and through it. The idea of journeying into a black hole to try to find God may seem bizarre, and I doubt He can be found there. Very likely, all one would find in a black hole is enough gravity to crush one into a blob of matter too small to see. But it’s curious that the desire to find God should play a part in a movie like this — even more that it played a part in one of the Star Trek movies. Because that quest is one of the defining things about humanity, even when that quest has been essentially denied as useless by materialists. We’ve designed many different bridges in our attempts to find our gods, please our gods, placate our gods, and petition our gods. We’ve designed great edifices to celebrate our gods and our own dedication to our gods, to worship our gods, to make our gods happy. We don’t need to shot ourselves into space and jump into black holes to find God. We do not need to go inwards and jump into “black holes” inside ourselves. God has come to us, and God’s words and thoughts can be understood by what He has told us in His Word. 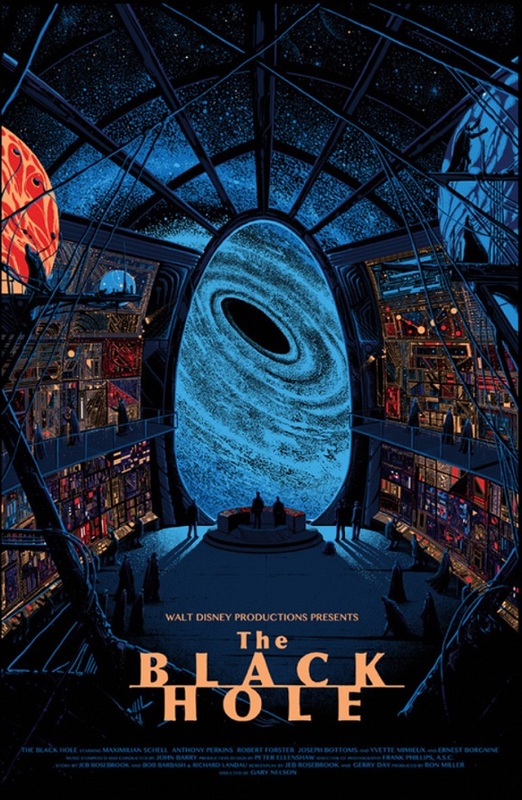 The Black Hole is a bit of a gem, maybe not a diamond but still a lot better then a lot of sci-fi that has come out over the years. I’d even put it above some recent efforts, like Pandorum or Mission to Mars. It’s a good one to watch, if one can keep one’s expectations reasonable. This is one movie that would likely benefit from a quality redo, something the would fix some of the dull elements of the plot and update the effects. Still, even as it is now, I’d give it a recommendation. Thanks for sharing about this older sci-fi movie. I have never heard of this movie before. Somehow I find myself picturing the friendly bots from Portal 2 as you describe bots on the good guy’s side. I wonder if this movie is on Netflix.